We’re in a golden age for NBA offense. Teams are scoring 110.1 points per 100 possessions during the 2018-19 season, according to Basketball-Reference.com — a full 1.3 points per 100 possessions more than the previous high of 108.8, which was set two years ago. Regardless of why, the impact of turnovers cannot be undersold. […] You can’t score if you don’t have the ball. 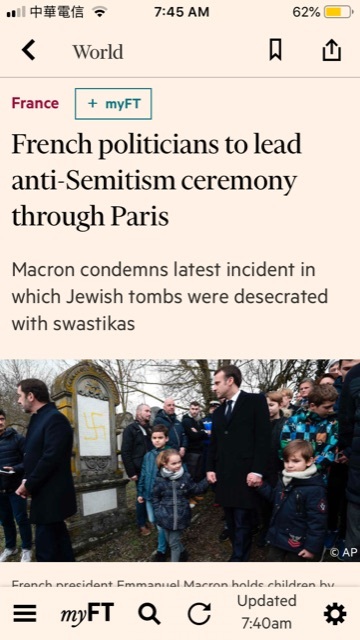 I think they meant "anti-anti-Semitism ceremony". I noticed this in an article on Salon.com, "Charter schools are pushing public education to the breaking point: Charters are driving Boston’s public education system to the financial brink" by Jeff Bryant, published on Friday, February 8. Or so says the text. But I think this should be "his is not to say MA might not be doing a better job", with a second "not". The construction with two "not"s is hard to parse (maybe I'm wrong that there should be a second "not"! ), perhaps leading to a sort of "edito" based on the thought that so many "not"s can't be right, but the trickiness seems partly related to the presence of the "might". Labour is likely to table a vote of no confidence in the government, though it is unclear whether it would do so immediately – and even less unclear whether it could win it. "[He] is not going to not accept money"
Mr. Mulvaney outright rejected Mr. Durbin’s offer. “The president is not going to not accept money for a border wall,” he said. Roxy Jacenko's fourth literary work, Roxy's Little Black Book of Tips & Tricks is set to hit shelves in less than two weeks. But the 38-year-old suffered a less-than-ideal set-back in recent months thanks to a rather unfortunate typo that appeared in the book's first print-run. 'Without question it's a nightmare and not something anyone wants to happen,' Roxy told the publication, claiming that six proofreaders from publisher Allen & Unwin managed to miss the error before the book went to print. Six proofreaders? Anyhow, perhaps we should say that they didn't fail to miss it. No one, least of all my family and close friends, would deny that I am somewhat hidebound, stuck up to my nethers in mud. I mean, don’t get me started on the subject of mobile phones and the inability of so many of their owners not to comprehend that they are incapable of walking and using these devices at the same time. Thus, when I see the word toolkit, it conjures up images of the contents of a red cantilevered box, containing hammers, various screwdrivers, bradawl, spanners (again various), sundry nails, screws and broken electric saw blades (no, I don’t know why either), and assorted oddly shaped pieces of plastic that probably came from a long-discarded Black & Decker Workmate. Alas, no longer. A recent report, on parents who won’t let their sons wear a skirt to school possibly being referred to social services, talked of “Brighton and Hove city council’s ‘trans inclusion schools toolkit’”. Now, without wishing to get involved in the tangled issue of gender identity, I would just like to stick my crusty old arm over the parapet and stand up for toolkit’s proper meaning. Brighton and Hove council could just as easily have used the word advice and it would have had exactly the same meaning. Or, to put it another way, ain't no toolkit without no hammers. This one has the unusual property of being purely lexical, with no explicit negations at all. President Trump on Friday ordered the FBI to reopen the investigation of Supreme Court nominee Brett M. Kavanaugh’s background, a stunning turnaround in an emotional battle over sexual assault allegations that has shaken the Senate and reverberated across the country. Late Friday, by voice vote, the Senate took an initial step to move ahead on the nomination. Barring no major revelations from the FBI, the Senate could vote on confirming Kavanaugh next weekend, days after the start of the high court’s session. “There’s no doubt he’s leaving a void, kind of an irreplaceable void,” Sen. Dan Sullivan (R-Alaska) said Tuesday. I may be missing something here. US Intelligence says it is Russia. Putin says it isn't Russia. I don't see any reason why it would be Russia. I don't see any reason why it wouldn't be Russia. Update: Now that I think about this, I may have misinterpreted the point of this comment, in which case the point it makes was not something others have missed and that deserves wider attention, but rather was something of a restatement of the obvious. My initial impulse was to delete the post, but on reflection I'm leaving it up, as an object lesson in the way that this multiple-negation stuff can make your head spin.